I found this very apt little political comment from ‘The Directors’ cartoon in Private Eye for 7th – 20th January 2005. It’s as true now as it was eleven years ago. And I’m sure that is very much how privatisers and the Tories, Lib Dems and New Labourites, who cut back on benefits do see it. Nicky Morgan Lies about the Privatisation of Education. Again. Last week I posted up the article in this fortnight’s Private Eye attacking the government’s plans to neuter the Freedom of Information Act. 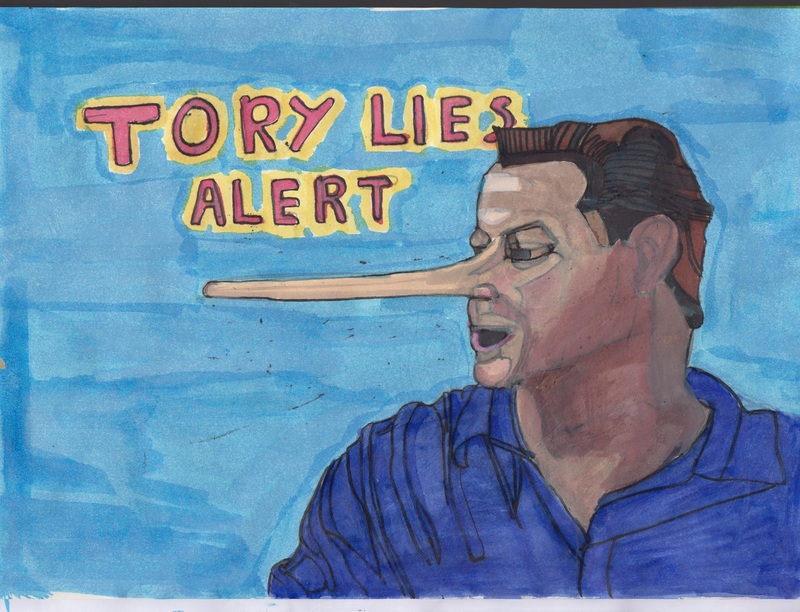 That same issue also carries another article, Academy Schools: Morgan’s Meanies, attacking the education for minister for her lies about campaigners against the government’s policy of transforming state schools into academies. According to the article, she branded them ‘enemies’, and has accused them of unscrupulous tactics, spreading malicious rumours and threatening parents in favour of academy schooling in a press release entitled “Headteachers hit back at enemies of academies”. This is Nicky Morgan, and so the truth is more likely to be 180 degrees opposed to what she actually says. The article points out that none of the ‘head teachers’ in the press release are head masters or mistresses. They’re actually the heads of the private education firms, hoping to win contracts to take over their management. She does. It’s 25. The whole policy is a wretched failure. However, it’s a highly lucrative failure for the Tory backers, who wish to see state education privatised completely, hankering after the days when the middle classes sent their children to grammar schools, while the proles could be confined to the secondary moderns. But they can’t admit that, of course. And so we get Tricky Nicky Morgan lying about how beneficial academies are, and ascribing all kinds of dirty tricks to their opponents. This really is a government that could give lessons in lying and duplicity to Richard Nixon. This is another meme from the Hope Not Hate Facebook page, The Real UKIP, I found over at the SlatUKIP site. 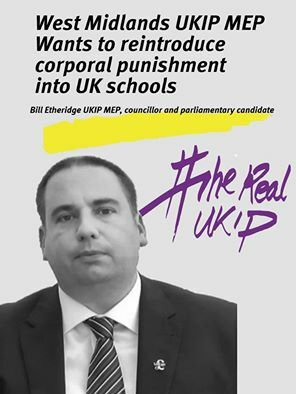 UKIP’s candidate for the West Midlands, Bill Etheridge, amongst his other bizarre and reactionary views, wishes to see the return of corporal punishment in schools. He isn’t the only one. A lot of people of a certain age get misty-eyed and nostalgic for the old days of corporal punishment. ‘I got the cane’, they say, ‘and it never did me any harm.’ In their view, only the threat of corporal punishment will solve the problem of the lack of discipline, disruptive and even violent behaviour in schools. This is a real problem, and you can hear some horrifying stories of teachers that have been physically attacked, sometimes suffering serious injury, by aggressive and violent pupils. There have even been notorious cases where a teacher has been murdered by one of their pupils. To add insult to injury, teachers are further demoralised by the lack of support given by their headmasters and politicians. 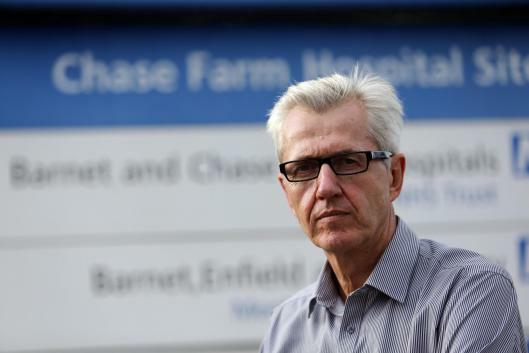 One teacher, who wrote about his experiences spending a year as a supply teacher in some of the poorest performing schools, described how demoralising it was, when, after complaining about a violent or aggressive pupil, the headmaster called them into examine the situation. Rather than disciplining the pupil, the head teacher simply took the approach that the teacher must some how have been also wrong. Corporal punishment, however, probably isn’t the answer. If you also talk to member of the older generation, you can also hear some grim stories about what it was like at school in the mid-twentieth century, when teachers had the power to strike and beat their charges. My father went to one of the better schools in Somerset, and he describes some of the teaching staff there as violent sadists. Apart from caning and blows for even the most minor infraction, he also describes how one teacher, exasperated by one pupil’s lack of understanding in the French class, threw the lad out of a window. Other TV personalities have had the same experience. Terry Wogan, one of Britain’s favourite broadcasters, was on cable/ satellite TV this week in a half-hour programme about his home country. He was touring the land of Ireland, from Eire to Ulster, in a taxi, taking in Dublin, Limerick, Galway, Londonderry/Derry, and Belfast. In one episode, he returned to his old school, meeting up with his old school friends, and chewing the fat about their experiences. Like Dave Allen, he described how the school, in the person of Fr. McGlochglan, tried to put the fear of God into their students. He stated that, rather than strengthening his faith, it left him with no great love for the Church and its teachings. Later, talking to a priest, who he used to have on his radio show in Ireland, El Tel said he was an atheist. I’ve heard much the same from members of my own family. One of my uncles was lapsed Roman Catholic. Although technically a member of the Church, he never practised because he had been put off by the viciousness of the monks, who taught him at school. And it wasn’t just the Roman Catholic church. One of my friends had the dubious benefit of being privately educated. I can remember being surprised by his views on corporal punishment when I was talking about the issue one day at College. My friend is certainly no rebellious firebrand by any stretch of the imagination, yet he was firmly against the return of corporal punishment because of the sadistic behaviour of his headmaster. The man would can children for even the slightest fault, such as having a tie that wasn’t straight. There is a problem with disruptive behaviour and violence in schools, but the solution isn’t corporal punishment. There’s a lot of pressure on schoolchildren already, with the requirement to do well at their sats and the other tests, which successive governments have seen fit to burden them. But apart from teaching them to pass exams, the goal of education should be to develop their talents. Stephen Fry attacking the Tories’ education policies under Maggie or John Major cited the Latin root of the word e-ducere: to lead out. The aim of education should be to lead out and develop the child and his or her talents and interests. Every good teacher not only wants to teach their subject, but to see their pupils actively enjoy it. Corporal punishment and the vicious, sadistic discipline inflicted on past generations of children doesn’t do this. It has made too many children hate school, and the teachers and institutions that inflicted it. Bill Etheridge is simply wrong. On the other hand, if you want a new generation of beaten, brutalised, twitching and resentful ex-school kids, then he’s clearly the man for the job.